Hello and happy belated Tuesday! If you were here yesterday, you'll know that I had run out of daylight to photograph Fifi Bunny and blog on the topic of photography in the creative business. So, I'm back today to show you some pretty pictures of the pretty girl and to give my two cents on what I've learned in the past couple of years in taking photos for an online creative business. I hesitate to provide any sort of instructions or know-how on my blog. I feel that I'm pretty far from being experienced in any of this much less give tips and direction on any topic. So, today, I really want to just share what I've learned about photographing the things that I make. I'll share the mistakes I've learned as well as tools and things that have worked for me. If you're a maker, maybe you'll be able to take some of it with you or maybe you'll correct me and tell me how it's really done because you are very welcome to comment and provide feedback anytime. The online creative small business is a rapidly expanding one. There are thousands upon thousands of amazing artists who operate a global business from a single studio in their home or in a simple small space which means that they are marketing their products purely from cyber space which then means that their customers are not able to have the real-time experience of touching, smelling or feeling the item or piece of art that they want to hold, wear or display in their homes. As such, creative photography is an art in this arena. NATURE - Fig & Me must be the first place I'll always mention because that's where I started my journey into the world of making and frolicking with dolls. If you're reading this blog, most likely you know very well Fig & Me. If you are new to all of this, then, please...go there and you'll see. I never tire of looking into Fabiola's magical world. Her photography captures every essence of what she makes. Her creations are beyond stunning to begin with. Then, you add creative photography to it and you get a magical, whimsical world filled with fresh air, funny characters, rich textures and the essence of a quality handmade item. If you ask me to spurt a single sentence that immediately comes to mind when I think of Fig & Me I'll say, "beautiful little beings in flurry soft white snow in the woodlands." 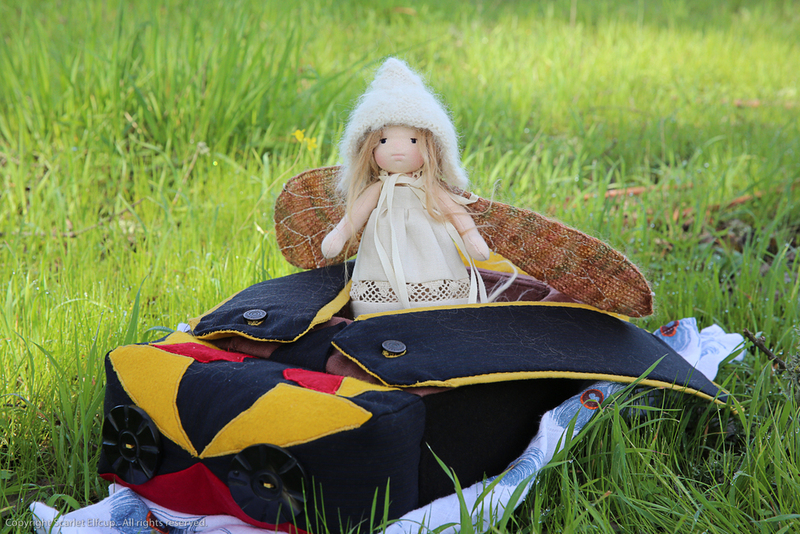 In her photography of the dolls that she makes, Fabiola uses a lot of the nature around her and it really resonates with everything that she makes. And when you enter this world, you can envision yourself not just holding the doll that she's made, but 'being' or wishing you could be the doll that she made. PROCESS - Lalinda. At Lalinda, I get to visit and feel as if I'm in Agnieszka's studio. Her photos are always set up differently for each doll. It gives me the sense that I'm in a play world. The backgrounds are ever changing but so contextual to the item that she's displaying. 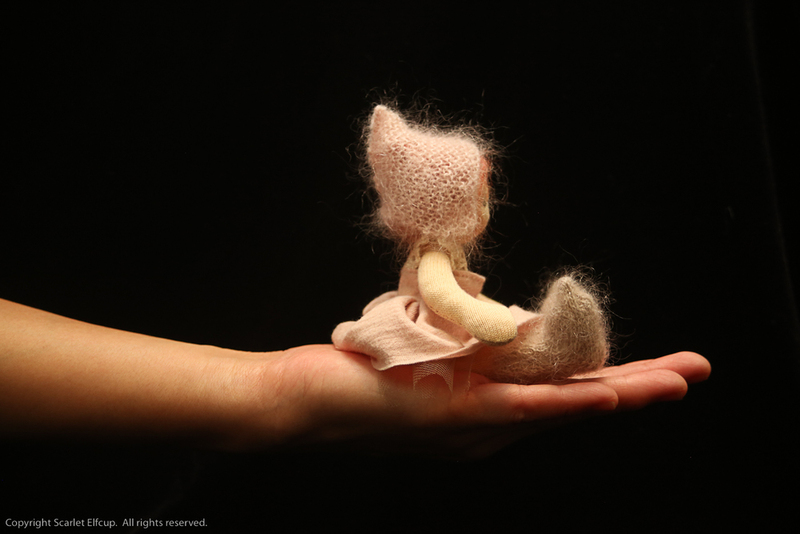 I love seeing photos of parts of her process of making the dolls or the bird or the hand felted worlds. It's fun to see a picture of the felted head uncovered and then to see side by side a photo of what that felted head looks like on a completed facial structure. Fun, fast and furious is what I think of when I visit Lalinda because she's so darn quick! There's always something new that she's made that is displayed in a very linear and methodical way because she posts them in the same manner on a frequent basis. WONDER & MAGIC - Mister Finch...well...who doesn't know or love Mister Finch? If you are remotely interested in the world of textile art, then surely you are already familiar with Mister Finch. Mister Finch makes the most amazing creations I've seen around. I like to visit his website, not because I can afford much of anything that he makes, but when I go there I'm in a completely different world....magical, wonderful, beautiful, exotic, mysterious, curious, whimsical, imaginative, creative, happy....these are just a few descriptions of the feelings or experiences I get when I visit Mister Finch. His photography is mostly simple...extraordinary handmade museum quality pieces of art presented on mostly plain backgrounds. His work is so exquisite that any "noise" added to the visual effect would almost be too much for the eye. Mister Finch's work is marked by the extraordinary detail in colors and textures and the items themselves are often so curious that he simply needs a plain jane background and good lighting to highlight his creation. But, it's not just that...you'll notice that his props are very unique and creative...spiders serving tea with their long, wiry legs, birds lying in peace inside glass coffins, fat furry bumblebees towing old world hearses. Now, who would ever want to go back into the real world after visiting Mister Finch? I like black backgrounds. I wish I could use it for everything. But, it doesn't always work for everything. On the photo to the left, it worked beautifully for Seren. The lighting was great and the photo really highlights that tiny doll and her size. On the right, it worked terribly for Amandina. The lighting was not good and her face is shadowed. It also provides no context for scale or texture...just a boring and dark background. 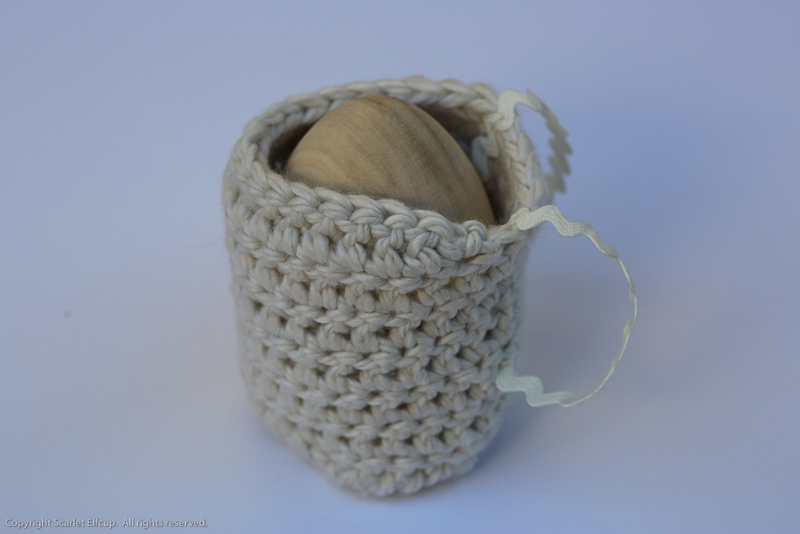 If the item you made is so small, a macro lens and a plain black or white background work perfectly together. But, make sure the lighting is good. On the topic of lighting, we all know that natural, indirect lighting is the best form of lighting for photography. Mark my mistake here. If you're going to do a nature photo session, choose a location and time of day when the sun is not directly on the subject. The photo session for Cicindela and Elytra was one of my worst sessions yet. I chose a space that offered only direct lighting and I chose a time when that very lighting loved to cast shadows that just made every photo agonizing to shoot. So, if you are going to do an outdoors shoot, don't do what I did for Cicindela and Elytra's photo session. You can see I have a lot to learn still. I can go on and on about photography because it is one of the things that I love to spend time on. But, my depth of knowledge on the subject is really quite shallow and the topic can be delved in so deeply, which is why there are books already written for people like you and me. So, I'll end today's chatter by sharing a few of my most necessary tools and resources in regards to creative business photography and let you get on with your day. Flash - I don't like using the flash, but it's quite handy as reflective lighting and I always have it on me. Wireless remote clicker - This wonderful little tool makes it very convenient for you to fire your camera without touching it, therefore providing less room for blurriness in your photos. Tripod - a must if you want photos to come out clear when using a Macro lens to photograph small things or small details. Artful blogging magazine - I pick these up at the stores from time to time because I love to look at the beautiful photographs by bloggers and it's very inspiring. The Crafter's Guide to Taking Great Photos by Heidi Adnum - This book is a great resource if you want to learn the ins and outs of photographing your handmade goods. It'll give you useful things like how to DIY your own light box so that you don't have to spend hundreds on a store bought one. Now, on to the treat of the day! Fifi Bunny. 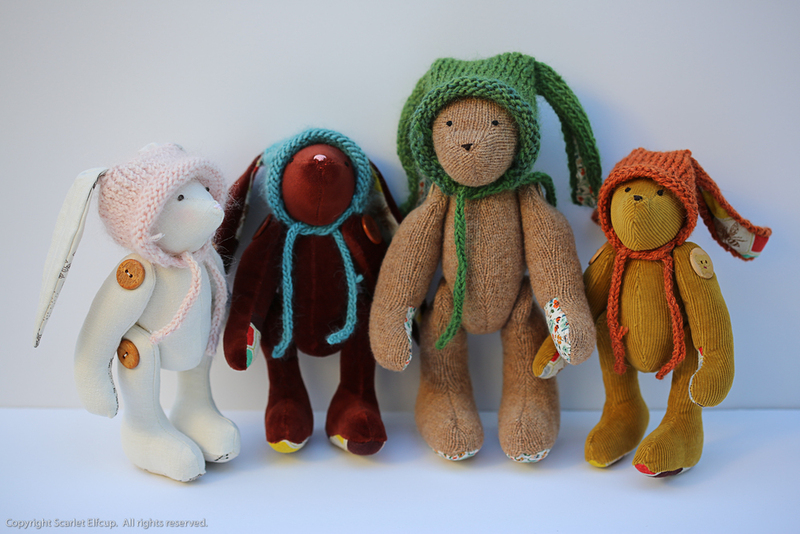 Fifi Bunny is an 8" (20 cm) doll, made with natural materials. Her facial skin is made with premium quality swiss cotton interlock and her body/bodysuit is composed of ultra-soft, pre-washed, clean, repurposed 100% cashmere. 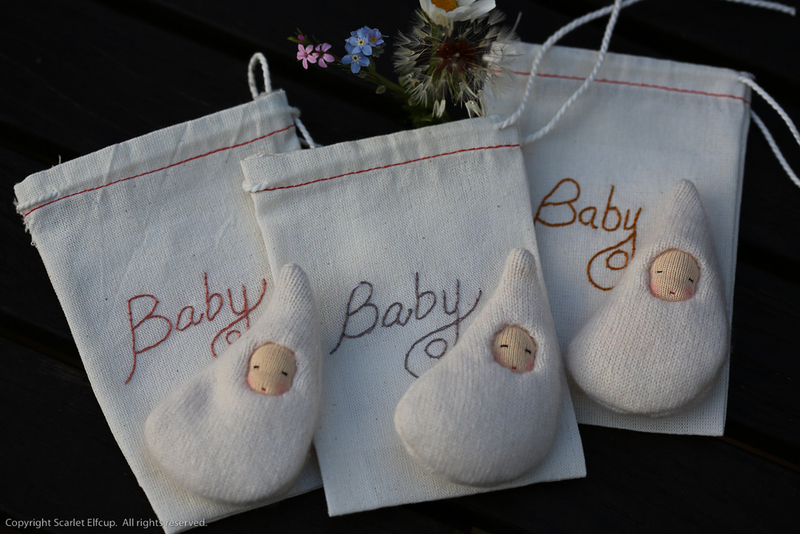 She is softly stuffed with bio-wool and weighted with non-toxic, washable stuffing beads. Her bunny bodysuit is permanently sewn on, but her hat is remove-able to reveal a sweet head of red hair. 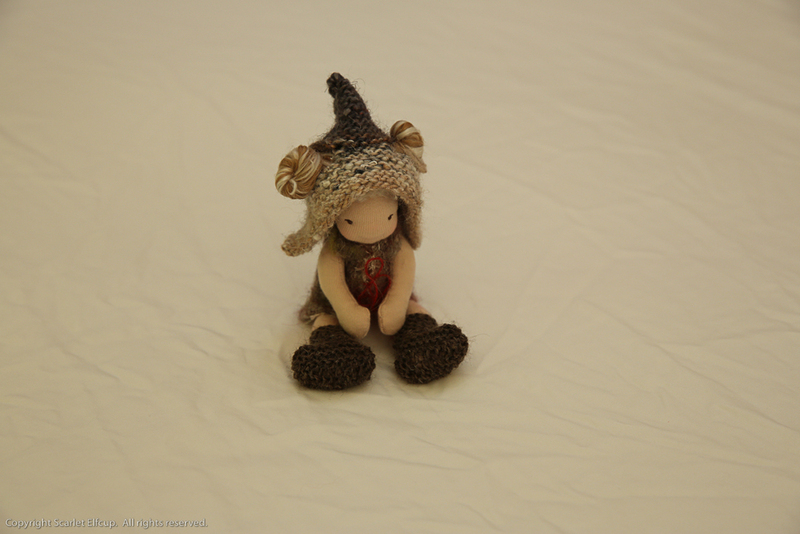 Her hair is made of mohair yarn tied into two braids. 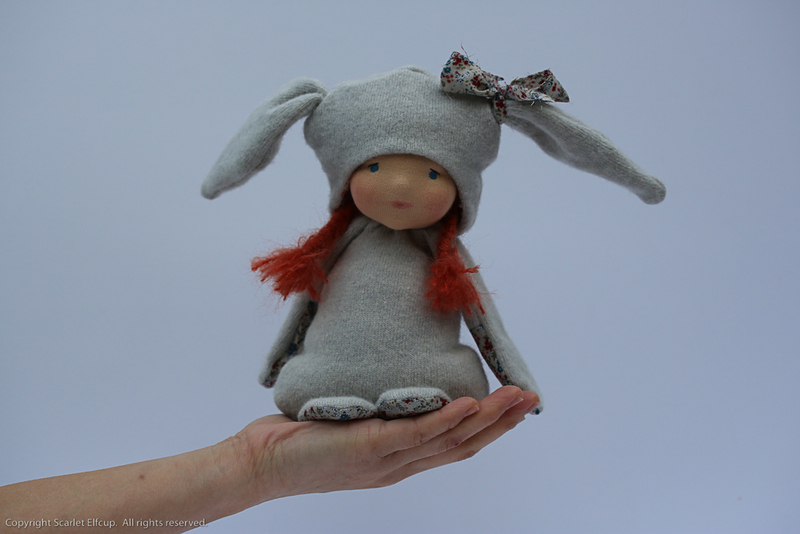 Her bunny hat is adorned with a piece of printed 100% cotton fabric for the bow. The same fabric lines the inside of her hood, paws and feet. 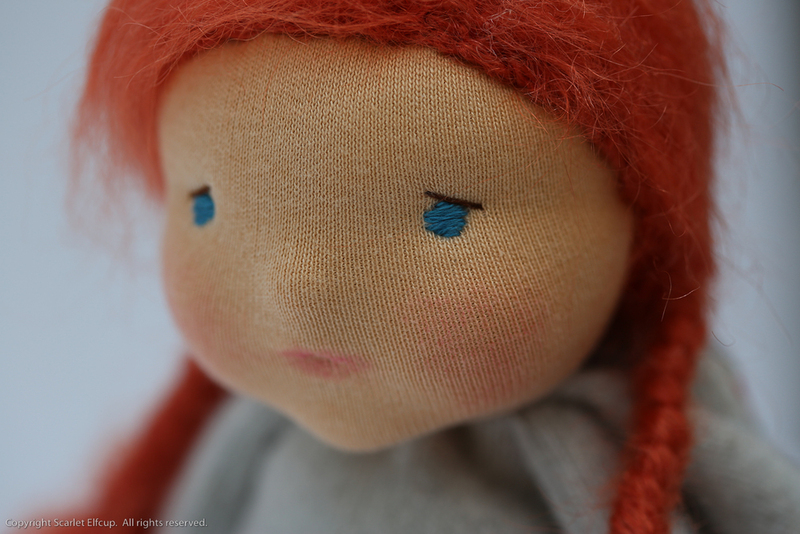 Her facial features are embroidered with 100% cotton floss. Her facial structure is sculpted to give her round full cheeks, an itty bitty nose, lips and chin. 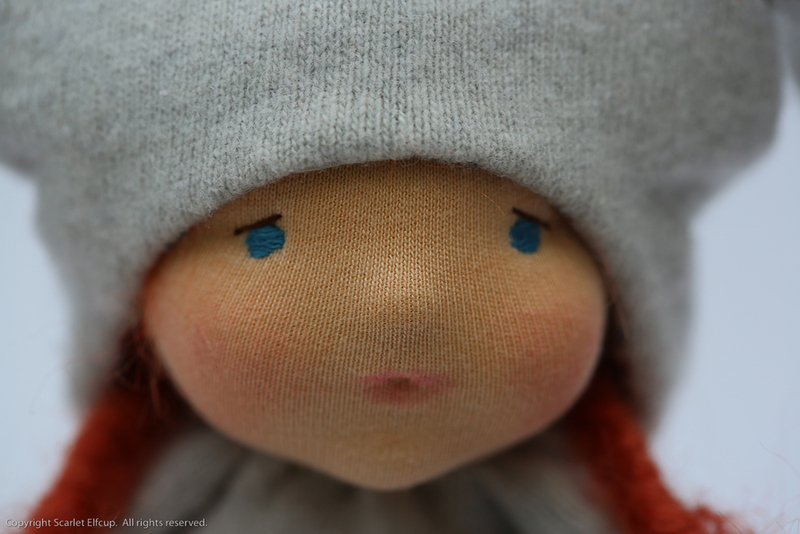 Her cheeks are blushed with red beeswax. She is made from Scarlet Elfcup's Fall Critters pattern....one of my favorite patterns to make something of for the Fall and now for the Spring. 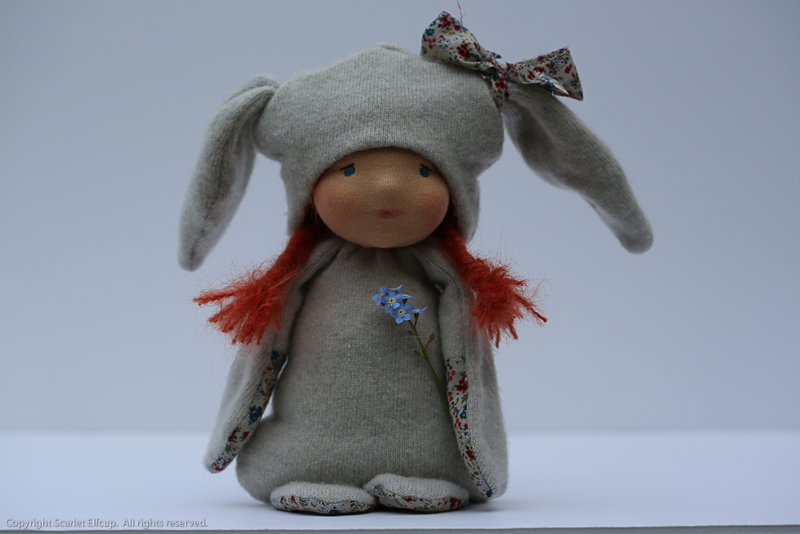 Fifi Bunny is being given away as Day 2's FREE gift from Scarlet Elfcup for being here to celebrate our 2-year birthday. 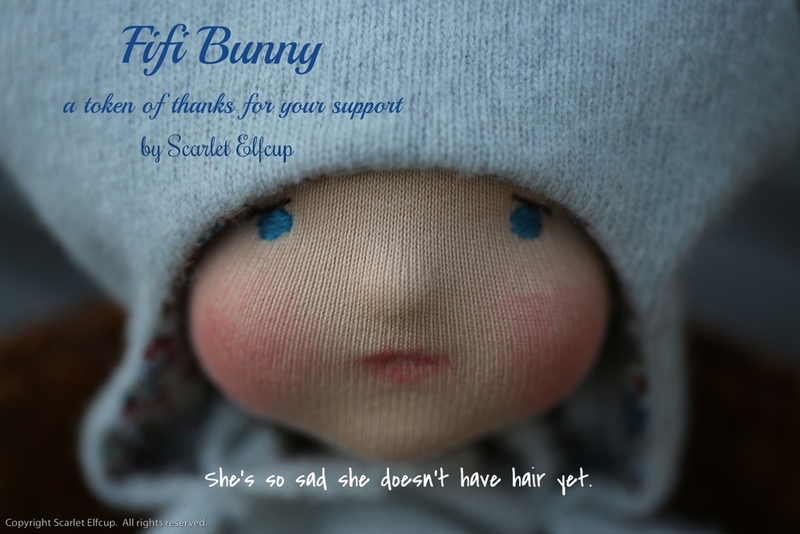 If you are interested in entering your name into the drawing to bring Fifi Bunny home for FREE simply follow Scarlet Elfcup on Flickr AND leave a comment or 'favorite' this photo of Fifi Bunny on Flickr. This will help me identify those who are interested in participating in the drawing so that I don't inadvertently spam all of my followers on Flickr. You can also enter the drawing by leaving a comment in the comment box below (be sure to leave your first and last name so that I can contact you in the case that you are a winner). Entries will close on Sunday, March 27, 2016 at 12:00 AM (PST). The winner will be notified sometime on Sunday via the Scarlet Elfcup blog.